On-The-Job Training Benefits Community Employment - Opportunities, Inc. Starting a new job is exciting; however it can be overwhelming at the same time. For individuals with diverse abilities, this career step not only takes training and confidence, but also an understanding employer. Opportunities, Inc. shares many valuable partnerships with community employers that go above and beyond in providing job shadows, temporary work experiences, and full-time/part-time employment through their Community Employment Program. These employers understand the time it takes to train determined workers, the commitment to assist, and the understanding of the workers ability. Through the agency’s customized job placement program, Opportunities, Inc. staff matches its many eager participants with employers who best suite their career interests and skills. In return, the individuals learn on-the-job training and gain real world work experiences. Opportunities, Inc. recently recognized four top community employers with their Employer Appreciation Recognition award for their continued commitment and dedication to the program. The awards were presented to Kwik Trip in Jefferson, Rushing Waters Fisheries in Palmyra, Hi-Way Harry’s in Johnson Creek, and Delafield Brewhaus in Delafield. Kwik Trip of Jefferson has been participating in the agency’s program since September 2013 and has hosted multiple temporary work experiences for individuals with disabilities, as well as gaining one great employee! Store Manager, John Deglow, stated, “It’s a mutually beneficial partnership. It’s an absolutely great program to be a part of and we found a great employee out of it.” Ashleigh G. was hired by the store following a successful work experience. She loves her job and enjoys the friendly atmosphere. “Ashleigh is a very focused worker who likes helping people. We look forward to her help everyday and she always brings a positive attitude,” Deglow noted. Kwik Trip of Jefferson believes in giving individuals with all abilities the opportunity to succeed in the workplace. Opportunities, Inc. is providing the support and expertise, which creates a great community partnership. Rushing Waters Fisheries in Palmyra has been providing career exploration and work experiences for adults and youth with all types of abilities for many years. Mauro R. who has been a participant with Opportunities, Inc.’s Community Employment Program in the past has been a proud employee of Rushing Water’s for the past year now. Mauro had great interest and skills related to the fishing industry and his community employment specialist created a successful job match for him following an 8 week work experience. It gave Mauro an opportunity to learn the position, gain confidence and establish himself with the employer. As a result, Rushing Water’s was able to realize Mauro’s skills and abilities. Owner, Peter Fritsch, stated, “The partnership has been easy. From the beginning it never felt too much. It’s hard to find a great employee and we found one. Mauro is our ‘get it done’ guy.” Mauro is responsible for assembling boxes, cleaning, and empting the trash. He works every day and enjoys his coworkers. The partnership is truly a great match and has shown tremendous collaboration. Hi-Way Harry’s in Johnson Creek has employed a young individual, Ryan M., through Opportunities, Inc.’s Community Employment Program since July 2014. The steakhouse employees have embraced the value in a diverse workforce and have become real mentors for him. General Manager, Donn Renning, noted on Ryan’s job performance, “He is great. He always shows up on time and I can count on him. He does his job correctly and doesn’t complain. We miss him when he is not here.” Ryan is a dishwasher, but also stocks supplies, cleans, and maintains the kitchen work area in a clean and orderly condition. He works extremely hard and will always keep busy during his entire shift. Hi-Way Harry’s has been an outstanding employer and proven success for the program. 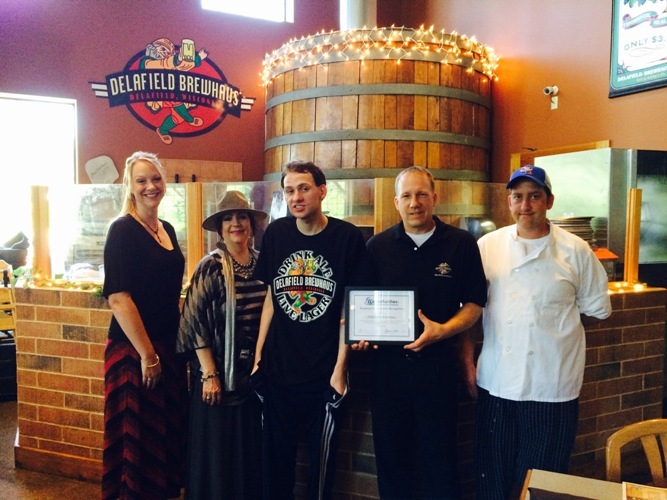 Delafield Brewhaus in Delafield has become a strong mission partner with Opportunities, Inc.’s program over the past year. They have embraced the Community Employment Program through their offering of job shadows and work experiences for the many eager participants who desire jobs in the restaurant industry. Sam H., a young man who decided to participate in the Community Employment Program while enrolled in the Easter Seal’s Culinary Program, gained valuable experience while in a temporary dishwasher assignment with the restaurant, which lead to them hiring him on permanently. Sam has since been doing an outstanding job and works very hard. General Manager, Eric Knutson, stated, “It’s been wonderful giving Sam an opportunity. It’s not about filling a dishwashing spot, it’s more than that. He has a great work ethic and has grown over the months.” Due to the success of the Community Employment Program, Delafield Brewhaus decided to collaborate further with Opportunities, Inc.’s Co-manufacturing division to fulfill their bottling, packaging, and labor needs for their new brewing project. The partnership has cultivated into an exciting occasion for both companies to further expand employment training for individuals with all abilities in the workplace! Opportunities, Inc. is honored to recognize its outstanding business partners that understand the value in expanding a diverse workforce. Not only does it provide them with dedicated employees, but sets an example for the community that everyone can contribute if given an “opportunity”! John Deglow, Store Manager, Kwik Trip; Ashleigh G., Kwik Trip employee; and Amber Czech, Employment Training Specialist, Opportunities Inc.
Peter Fritsch, Owner, Rushing Waters Fisheries; Mauro R., Rushing Waters Fisheries employee; and Lori Turner, Employment Training Specialist, Opportunities Inc.
Ryan M., Hi-Way Harry’s employee; Donn Renning, General Manager, Hi-Way Harry’s; and Betty Arntson, Director of Vocational Rehabilitation Services, Opportunities Inc.
Michele Schwabe, Employment Training Specialist, Opportunities Inc; Cathie Owens, Sales Representative, Opportunities Inc; Sam H., Delafield Brewhaus employee; Eric Knutson, General Manager, Delafield Brewhaus; and Nick Hausser, Sous Chef, Delafield Brewhaus.